Boss Rob Page has told Cobblers fans not to read anything into the starting line-up for Saturuday’s final pre-season friendly at National League side Eastleigh (ko 3pm). With just a week remaining until the big Sky Bet League One kick-off against Fleetwood Town, supporters might be anticipating Page playing his strongest available team at the Silverlake Stadium. But the Town manager says that is not going to be the case, and the Cobblers won’t ‘show our hand’ on Saturday. Instead, all the tactics and system preparations for the visit of the managerless Cod Army will be done on the training pitch next week. 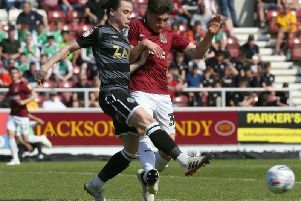 “In pre-season, the first couple of games are just about getting minutes on the pitch and it’s not about playing your best 11, or what we are going to play in the season, it is just about getting the levels of fitness up,” said the Cobblers boss. “It will be the same on Saturday, and I wouldn’t dwell too much on tomorrow or trying to read too much into it. “What we will do next Saturday against Fleetwood will be done on the training pitch. And the Welshman added: “We are looking forward to the game. Page is looking forward to the season finally getting underway, and he had some good news on the injury front, saying he believes the entire squad will be fit, apart from Raheem Hanley. “The countdown is on now, there is seven or eight days to the first game and we are ready,” said the Cobblers boss. “We have had our little setbacks with injuries that we could have done without, and we still have a couple in the treatment room, but the positive news is they are coming on great. “Most of them are way ahead of schedule, and by the middle of next week I think everybidy bar Raheem Hanley will be back and available for selection. “We will have to manage it with the fitness side of it, but it will be great to have them back on the training pitch.